The Albert Heijn Mosque was built in 2001 in an old supermarket in Amsterdam (NL),with big windows showing the prayers to passersby. The walls of the mosque were covered with Islamic mosaics and the name of Allah, created from the logo of Dutch most famous supermarket Albert Heijn. The prayers in the mosque were performed by imams who had especially come over from the Al Ahzar Mosque in Cairo, the Vatican of the islamic world. Their prayers were very beautiful to listen to. The praying Muslims in the neighborhood perceived the mosaic and mosque as truly Islamic. The mosque was packed at every prayer. The passersby saw Muslims praying for a supermarket logo and were confused. Some of the people passing by thought the mosque must have been a political action or a funny advertisement by Albert Heijn. Instead of what was really happening; the artwork had turned into a real authentic mosque. During the month Ramadan the prayers were also displayed via a live stream on a big video wall, in the gallery Smart Project Space in Amsterdam. In 2002 a book was published about the Albert Heijn Mosque: Albert Heijn wordt Allah (own production). The Albert Heijn Mosque appeared in several art books. 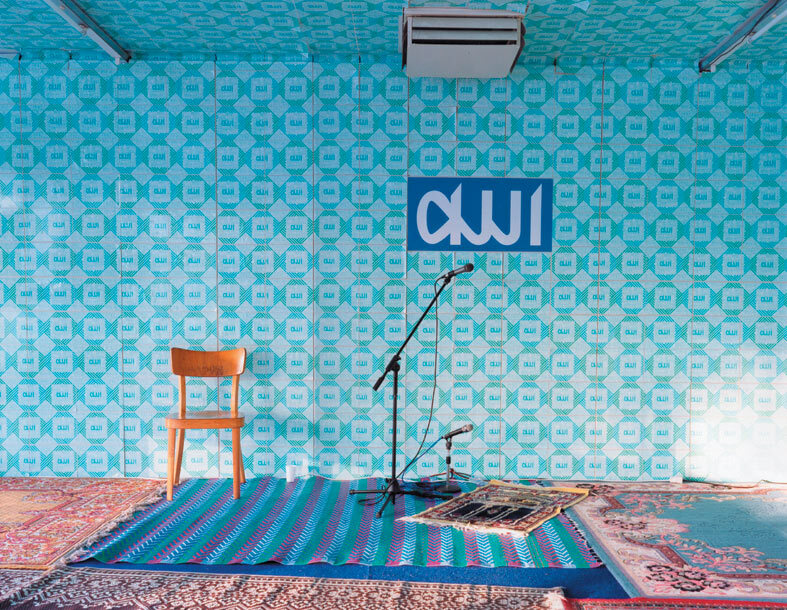 On January 15, 2011 two artworks from the Albert Heijn Mosque have been acquired by the Graphic Design Museum in Breda, the Netherlands, and added to the permanent collection. In the window shop of the museum, the mosque is rebuilt for the duration of the exhibit, until May 29, 2011. Moskee Al Ummah, fotolab S-Color, Universiteit Al Azhar, Stichting Bewaakt en Bewoond, Gemeente Amsterdam, galerie Smart Project Space, Gerrit Rietveld Academie, Prins Bernhard Cultuurfonds, Uitgeverij en Cultureel Centrum de Balie.